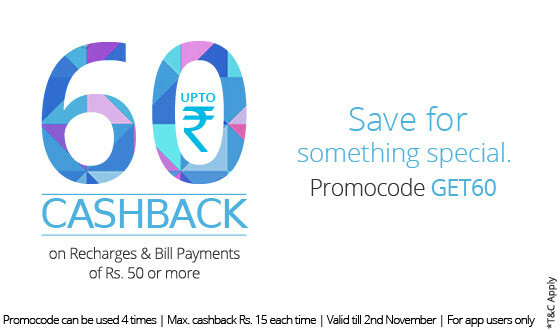 Here is new Paytm coupon to get upto 60 Rs cashback on mobile app recharges. 1) Open paytm android/windows/iOS app and start recharging with 50 Rs or more. 2) Apply coupon GET60 to get Rs 15 cashback. 3) Use this promo code 4 times to get total of 60 rs cashback. 4) Offer valid only on app recharges and it will expire on 2 November 2014. 5) Place recharge order in time gap of at least 15 minutes.